The McKee's RV Safe Scrub Bug Sponge is one of the best investments you can make in RV care. 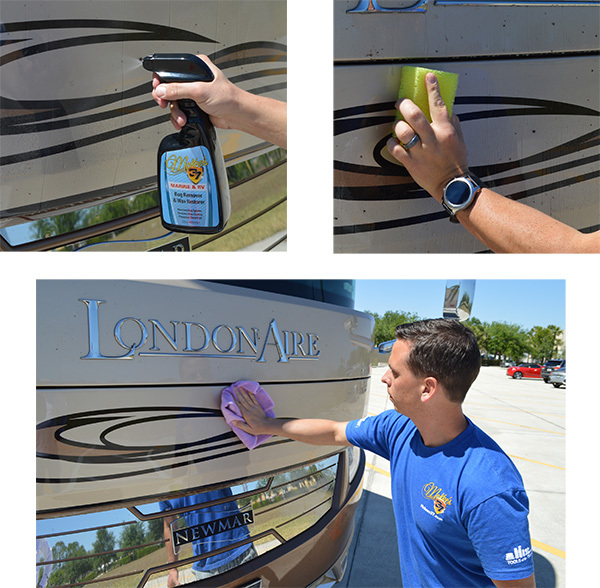 You can safely remove stubborn bug guts, road grime, and tar without scratching your RV’s delicate clear coat finish. The McKee's RV Safe Scrub Bug Sponge is 100% clear coat safe. Use it on paint, wheels, glass, chrome, plastic, and other hard surfaces that are in desperate need of a thorough cleaning. The McKee's RV Safe Scrub Bug Sponge is constructed out of unique honey-comb foam, allowing the sponge to effectively remove bugs and grime without scratching your paint. At first the sponge feels coarse and stiff, making you question the bold claims about it being clear coat safe. After you let the sponge soak in a bucket of soapy water for 3-5 minutes, it softens up considerably, while retaining the bug-scrubbing ability of its honey-comb design. You can also use it by spraying the panel down with McKee's RV Bug Remover Lubricant. The honey-comb design of the McKee's RV Safe Scrub Bug Sponge traps bugs and foreign particles as it removes them from your paint, ensuring the surface doesn’t get scratched. Dirt and grime is easily removed from the sponge, making it reusable hundreds or even thousands of times! The McKee's RV Safe Scrub Bug Sponge is so effective in its design and construction, you’ll wonder why it doesn’t cost more than $10! The McKee's RV Safe Scrub Bug Sponge is easy to use. Simply allow it to soak in a bucket of warm soapy water 5 minutes prior to use, and gently rub the affected area. There is no need to apply pressure! The design of the sponge will do all the work for you. You can also use it without soap and water by spraying the panel down with McKee's RV Bug Remover Lubricant. This method is much easier if you're at an RV park.